I just can't figure out how to activate colors in my shell. I know, this thread is old but the issue not. Here is a solution I've found to enable the global terminal colors. CLICOLOR=1 simply enables coloring of your terminal. LSCOLORS=... specifies how to color specific items. Then go to Terminal > Preferences, click on the Profiles tab and then the Text subtab and check Display ANSI Colors. Verified on Sierra (May 2017). You can use the Linux based syntax in one of your startup scripts. Just tested this on an OS X Mountain Lion box. This gives you a nice colored prompt. To add the colored ls output, you can add alias ls="ls -G". To test, just run a source ~/.bash_profile to update your current terminal. Side note about the colors: The colors are preceded by an escape sequence \e and defined by a color value, composed of [style;color+m] and wrapped in an escaped  sequence. eg. I always add a slightly modified color-scheme in the root's .bash_profile to make the username red, so I always see clearly if I'm logged in as root (handy to avoid mistakes if I have many terminal windows open). For all my SSH accounts online I make sure to put the hostname in red, to distinguish if I'm in a local or remote terminal. Just edit the .bash_profile file in your home dir on the server.. If there is no .bash_profile file on the server, you can create it and it should be sourced upon login. MartinVonMartinsgrün and 4Levels methods confirmed work great on Mac OS X Mountain Lion. The file I needed to update was ~/.profile. However, I couldn't leave this question without recommending my favorite application, iTerm 2.
iTerm 2 lets you load global color schemes from a file. Really easy to experiment and try a bunch of color schemes. 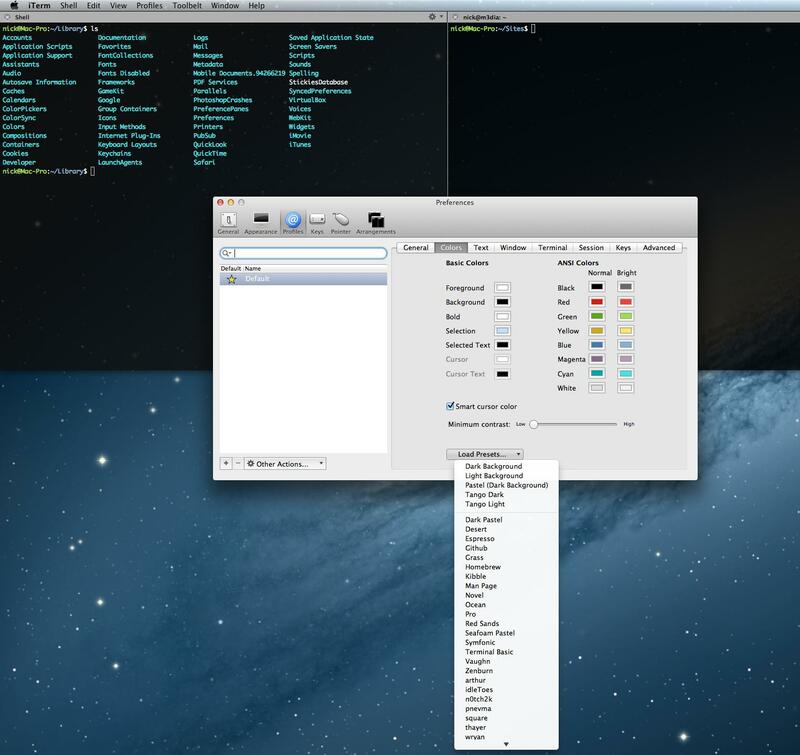 Here's a screenshot of the iTerm 2 window and the color preferences. Once I added the following to my ~/.profile file iTerm 2 was able to override the colors. Bonus: Choose "Show/hide iTerm2 with a system-wide hotkey" and bind the key with BetterTouchTool for an instant hide/show the terminal with a mouse gesture. Now you have to type source .bashrc in a terminal if already launched, or simply open a new terminal. If you want more options in your ls juste read the manual ( man ls ). Options are not exactly the same as in a GNU/Linux system. Check what $TERM gives: mine is xterm-color and ls -alG then does colorised output. Where, like Martin says, LSCOLORS specifies the color scheme you want to use. When I worked on Mac OS X in the lab I was able to get the terminal colors from using Terminal (rather than X11) and then editing the profile (from the Mac menu bar). The interface is a bit odd on the colors, but you have to set the modified theme as default. Further settings worked by editing .bashrc. Not the answer you're looking for? Browse other questions tagged macos shell terminal colors or ask your own question. How to terminate terminal that is connected to a AWS box but still leave process on?